Recent attempts to freshen up the ‘Princeton Shopping Center’ on North Harrison Street have seen remodeling of the parking lots and the arrival of new businesses, such as the instantly-popular Nomad Pizza (see photo above). But when it comes to providing for people on foot or on bicycles, the redesign has been something of a failure. Although a sidewalk extends all along North Harrison Street, there is no path connecting them to the entrance of Nomad Pizza. Instead, pedestrians must become nomads, wandering through the parking lot. This kind of glaring error fits with statistics that show that New Jersey is the state with the highest rate of pedestrian victims as a share or total traffic casualties. 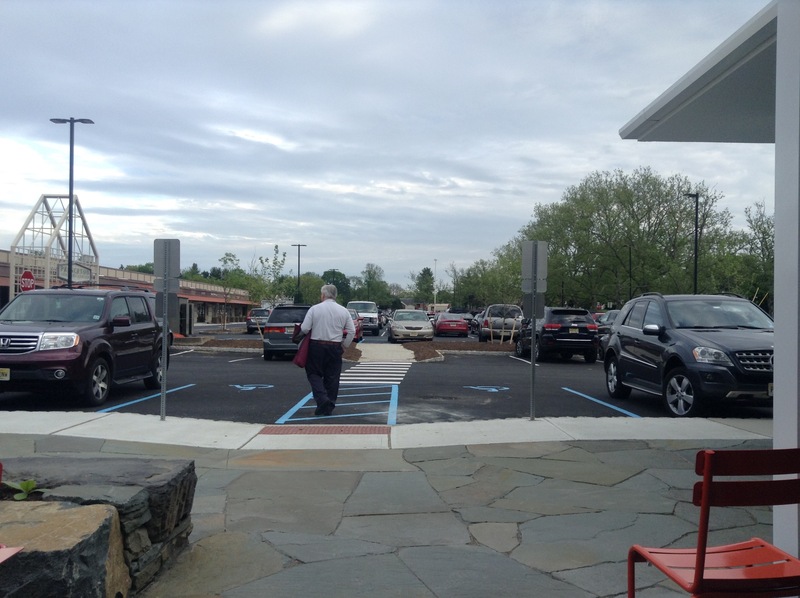 Bizarrely, there are new paths within the newly-reconfigured parking areas at Princeton Shopping Center, including around Nomad Pizza. They just don’t connect easily to the sidewalks on North Harrison Street. People on foot must take a long detour, or else cut across the landscaping to try to avoid mixing with traffic. The new paths seem intended mainly to get people to their cars. Once again, Princeton is incentivizing people to use a car for every trip. What about provisions for cyclists? Sadly, little better. 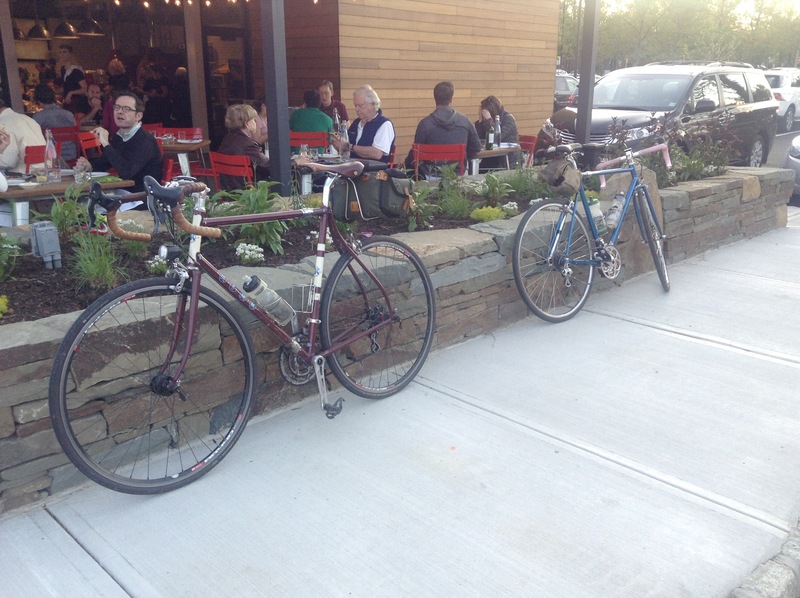 There are no dedicated bike facilities on the roads, of course, and there isn’t even any bike parking at the new Nomad Pizza. Maybe it has still to be added, but right now, cyclists are parking wherever they can find space. Luckily Princeton cyclists are adept at improvising places to park, because there is hardly anywhere in town with sufficient bike parking. 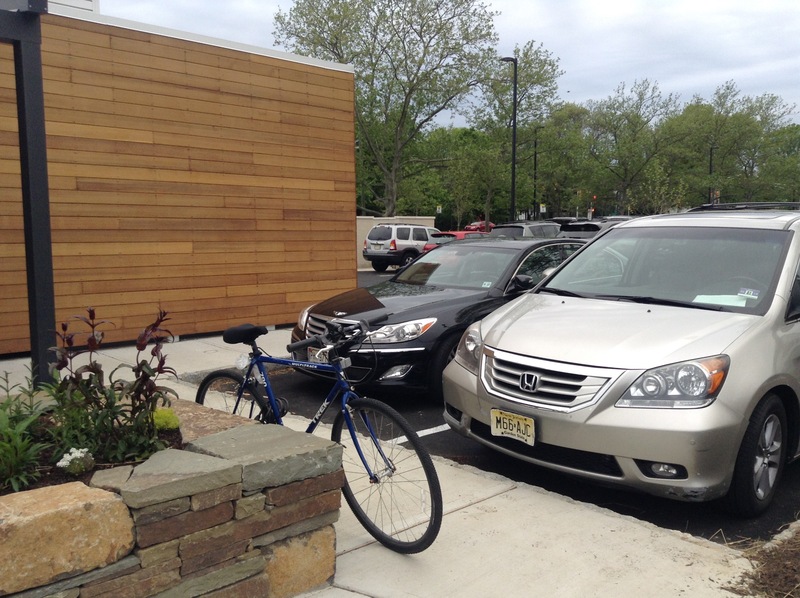 Walls, trees, parking meters, monuments – all these are regularly used to park bikes. Despite these deficiencies, the new Nomad Pizza is packing in happy eaters. They’re just mostly arriving by car. Maybe Princeton thinks that people will always choose to drive cars? But if we plan for cars, we get cars. The new circulation plan for Princeton Shopping Center was reviewed by at least two municipal committees, so it seems that the lack of bike/walk facilities is something that was endorsed by Princeton planning officials. In this case, it really wouldn’t have been hard to add facilities to make things safer and friendlier for people arriving without cars. 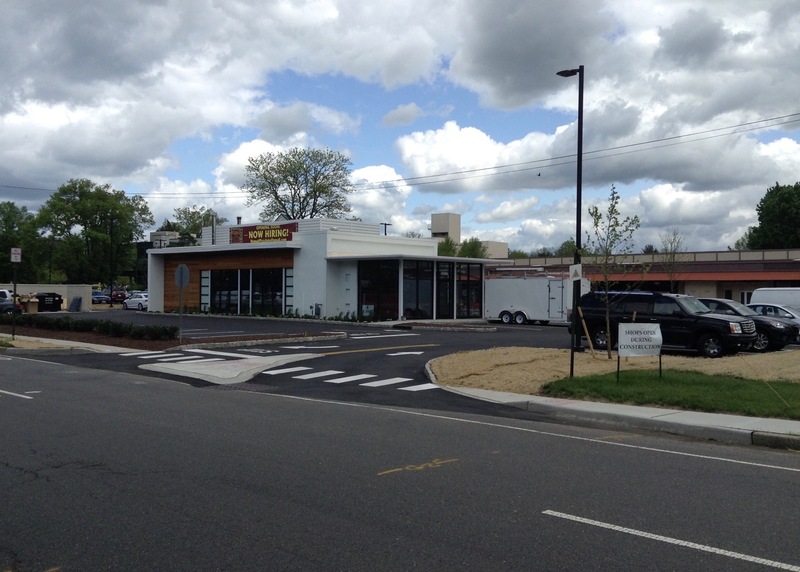 The Princeton Shopping Center was conceived as a 1950s-era car-dependent mall, but this is 2016, and people in the local area should be enabled and encouraged to choose other modes of transport. 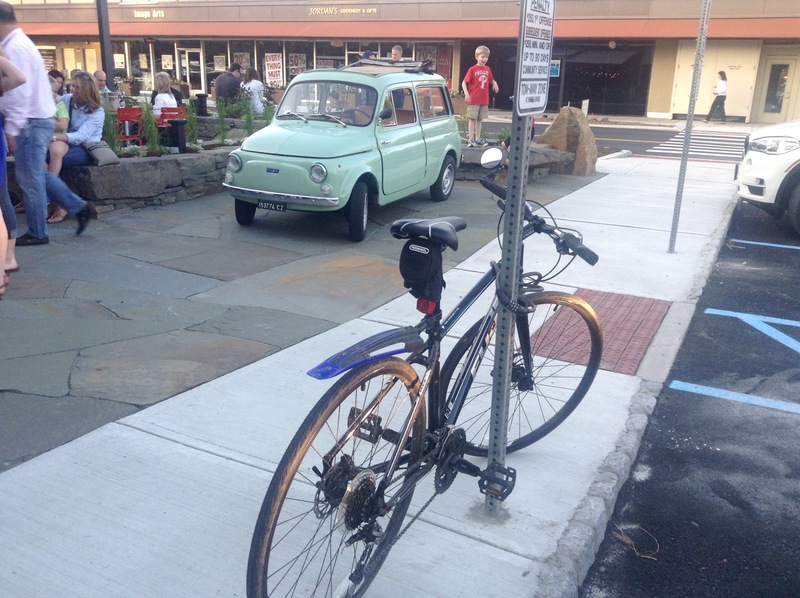 This entry was posted in Alternative Transportation, Complete Streets, Placemaking, planning, Princeton, Sustainability, Walking and tagged Cycling, Princeton, Walkability. Bookmark the permalink. The new design at the shopping center is even dangerous for people in cars. There are too many obstacles to go around. The older population which comprises much of the shopping patrons in the shopping center will find it especially frustrating as they have been used to the old pattern for so many years. I had a frightening experience when entering at the main entrance on Valley Road. The STOP sign that I always thought was misplaced as it caused folks to be backed up across Harrison St. was removed and put, instead, on the right side where the bus stop was. That proved to be effective and made more sense then the one coming into the center. Well now, that STOP sign has been removed and drivers are flying out of the shopping center, with no STOP sign for either direction and the speeding vehicles are preventing the incoming traffic from being able to turn left or right into the shopping center. Who designs these parking lots? I believe it has become a big hazard to walkers, bicyclists and drivers. The layout is too busy. I would not feel safe walking or biking into or around the shopping center.